Today Google's Matt cutts shocked the whole blogosphere by posting a tweet on twitter confirming about release of the new Google Panda 4.0 update. According to early updates, it is been seen that people are seeing a major decrease in their organic traffic. And if we are not wrong, this is just the beginning of the update it might be more deadly for the whole blogging community. Therefore, today in this article, we will be discussing about the recent changes that has come to Google search engine due to the new Google Panda 4.0 Algorithm update. For those who don’t' know, Google Panda is not a name of an animal it is Google's Algorithm that ranks different websites on the basis of their content. The main aim of this algorithm is to lower the rank of low-quality sites that have less or no content and give more exposure to high-quality sites on the top. Google also has other algorithm that takes care of the search results like Google Penguin, EMD (Exactly Matched Domains) update, Google Hummingbird and thousands of others that are not revealed to public. What's new in Google Panda 4.0? 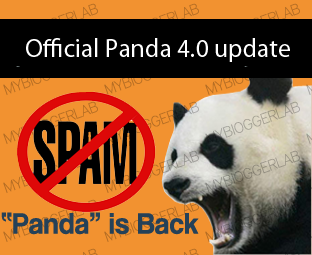 Panda 4.0 appears to be a major update that has made several changes in the data of ranking. Meaning, Google has made significant changes that how panda identifies which site s better than the other. The algorithm is much smarter and harder to tackle so those who think black hat seo could save them, than think once again because you might be wrong. Google is rolling out our Panda 4.0 update starting today. Google said that Panda 4.0 affects global languages queries to a different degree. In English for example, it impacted 7.5% of search queries that a daily regular users would certainly notice. Above is the tweet from Matt cutts, confirming about the release of Google Panda 4.0. This might be a new beginning to the way we see Search engine optimizing revolving as totally based on quality and professionally written content with heaps of authority and backlinks. Panda 4.0 on July 24th affected 4% Search Terms (Current). Panda 3.8 on June 25th affected 1% Search Terms. Panda 3.7 on June 9th affected 1% queries in United States while less than 1% worldwide. Incase your website is been affected then don't forget to check our article on How To Identify And Recover From Google Panda 3.8 Update? Google makes thousands of major and minor improvements to their search engine every day, every month, every year. Google told us, Panda update is more concern about the quality of your content, and if your site has fair enough content with good quality resource then it would certainly rank higher in the SERP. Let’s all hope for increase in our traffic till then peace, blessings and happy updating. I lost 5k unique visitors since May 21th, this is way.. Thanks google.